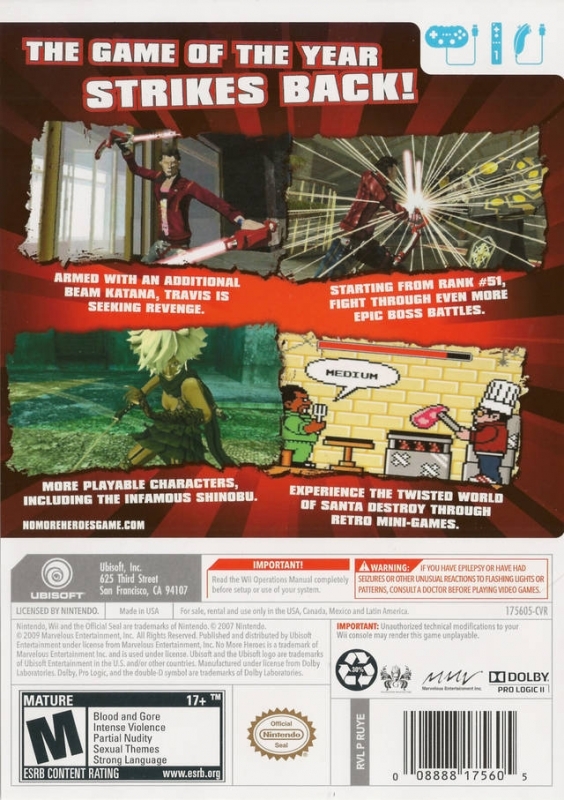 No More Heroes 2: Desperate Struggle is an ambitious sequel to the one of the Wii’s premier games of 2008 and one that fans of Travis’ quest to become the number one ranked assassin have been waiting for with bated breath for a long time. Well the wait is over, Travis Touchdown is back in a big way and with him comes more carnage, more mayhem, more awkward sexiness and of course more crazy moments from everyone’s favourite anime loving, wrestling fanatic assassin. Does Desperate Struggle slice up the rankings or is this just another bloody corpse set to litter the streets of Santa Destroy? For those who have played the original No More Heroes the control scheme for Desperate Struggle will come off as second nature. For the uninitiated, you move Travis with the joystick on the Nunchuck, ‘Z’ targets an enemy and ‘C’ switches between multiple targets. On the Wii Remote the ‘A’ button is used to slice at your enemies with the Beam Katana while ‘B’ controls your punches and kicks that can be used to confuse enemies, while the left and right directions on the D-pad are used for quick evasive rolls. 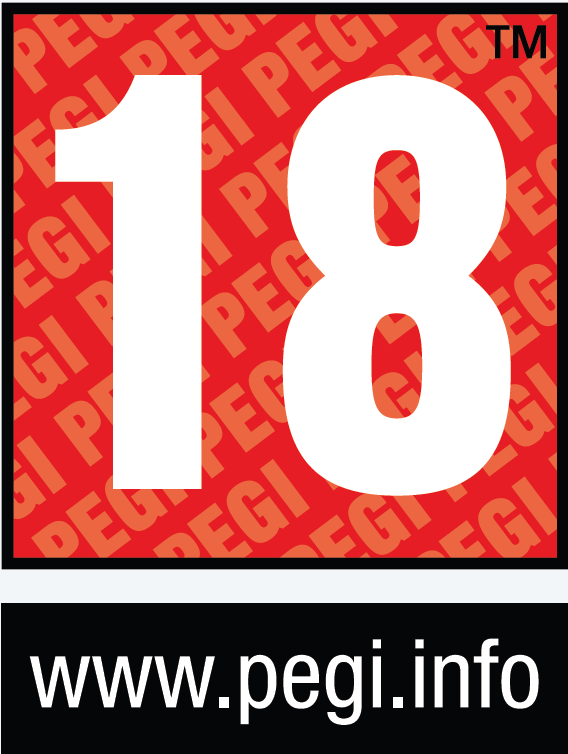 The game is also very light with the motion controls but the ones present are used very intelligently. When an enemy’s health bar reaches zero an arrow on screen will flash and a quick flick in the direction will eliminate the enemy with all kinds of gushing bloody goodness. The angle at which you’re holding the Wii Remote dictates how Travis holds the Katana, allowing him to block incoming attacks. This is the only real motion control related issue with the game, as it’s hard to gauge the needed height and movement needed to change Travis’ stance; sometimes it’s a subtle gesture other times you need to really move the remote vigorously. Finally to recharge your Beam Katana’s batteries you must hold the ‘2’ button while making movements that I’m sure most teenage boys are familiar with. (IE: holding the Wii Remote vertically and frantically moving it up and down.) The game also uses quick time events in the form of quick on screen flashes to indicate how to break a parry with an enemy or performing a wrestling move as a finisher. All in all the controls are very well executed. My only gripes being the exclusion of Wii Motion Plus support, which would have made the gesture based combat more responsive and also solve the issues with holding the Wii Remote at the proper height and the terrible camera, which always seems to throw itself into a corner just as the action is getting intense or you are staring down a boss. It should also be noted that the game allows you to use a Classic Controller for a more traditional experience, when using this option the motion gestures are simply replaced with a button based control scheme. 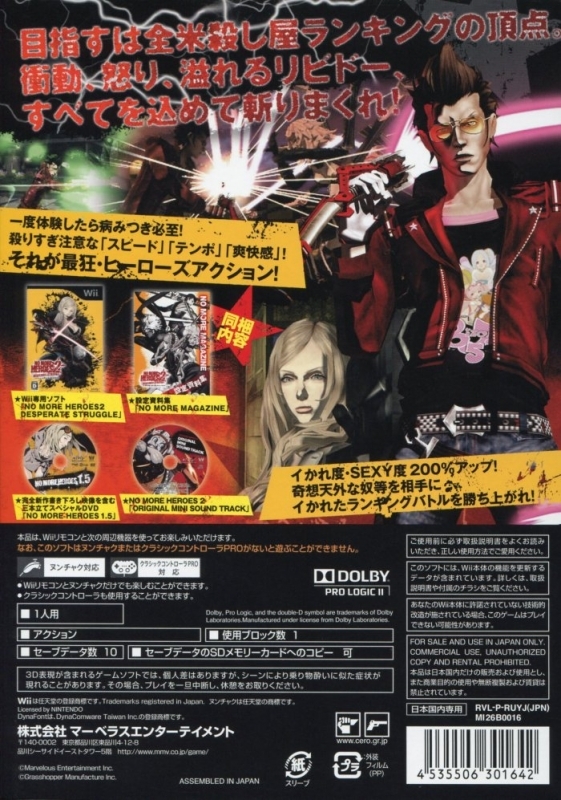 Several changes were made to the gameplay from the original No More Heroes. Once Travis is assigned a target for assassination, you can then move from your hotel room to the area where you are to meet your opponent. However the overworld navigation has changed dramatically, as now you simply choose the place you want to visit instead of riding there manually via motorcycle like in the original game. From the overworld map you can choose to either return to Travis’ hotel room at hotel No More Heroes, to either play with your cat Jeane, who has gained some serious weight since the last game and needs help dropping it, read through the latest issue of Weekly Backdrops to learn a new wrestling move or simply visit the bathroom to ‘drop a save’. You can then move to a variety of different locations throughout Santa Destroy, including the clothing shop Airport 51 to buy some new cloth and accessories, visit Naomi’s shop to buy new Beam Katanas or visit Ryan’s gym to upgrade your vital stats. 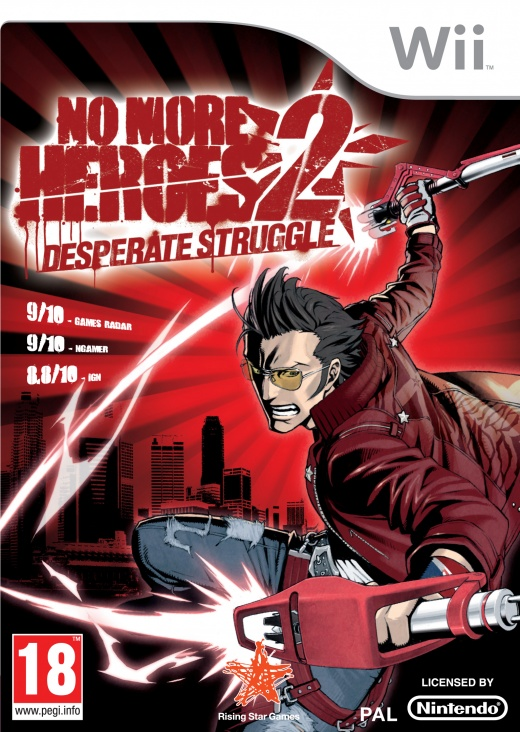 Once you reach your objective, you jump into No More Heroes 2: Desperate Struggle’s basic gameplay, a straight up action brawler. You move from room to room facing off against various types of enemies armed with all sorts of different objects ranging from blunt instruments to swords and even guns. Once all the enemies in a room have been reduced to dismembered piles of human flesh you can move onto the next area and repeat. While it all sounds very repetitive, the game does a good job at keeping levels short, meaning you will run into the boss of a particular area long before you get bored. Boss battles are anything but your standard affair, one minute you will be ‘simply’ slashing away at a seemingly normal enemy and the next you will be in space fighting giant robots and no I am not kidding. This variety in gameplay even carries over to the mini-games. In the prequel, you had to complete menial tasks to earn cash to spend on upgrades. The same is true for Desperate Struggle, however this time most (all but one) of the jobs are presented in a classic 8-bit style, complete with simple 2-3 button gameplay and even synthesised voices. In all, there are 8 jobs for Travis to find around Santa Destroy. These include Bug Out, which has Travis collecting insects and rodents. Lay The Pipe features Travis the plumber connecting pipes to make sure the water safely flows from one end to the other. Coconut Grabber, a re-imagining of the coconut collecting mini game from No More Heroes has an 8-bit Travis running from palm tree to palm tree knocking coconuts down and trying to catch them in a backpack. Pizza With A Vengeance puts Travis in the role of a pizza delivery boy who must reach his destination before time runs out, all while avoiding oncoming traffic and oil slicks. In Man The Meat you must take control of a grill station, making sure each customer’s ‘meat’ gets cooked perfectly. Tile In Style is a puzzle game where you must place blocks (that bare a striking resemblance to Tetris blocks) in a perfect rectangle. Getting Trashed takes us to outer space where Travis must collect floating pieces of garbage and ‘throw them in the ocean or something’. The last part-time job mini-game is Stings So Good and is the only one presented with the standard games graphics, this time around Travis is tasked with ridding Santa destroy of scorpions by slowly placing them in a bag and ‘disposing’ of them. Apart from earning jobs the game features 3 more mini-games, two of which are located in Ryan’s Gym, and are training exercises used to build both Travis’ stamina (health) and strength (power), like the jobs before them, these are also presented in the 8-bit style. The final mini-game, Bizarre Jerry 5 is well… bizarre. On the surface it is a pretty basic vertical shooter in the same vein as a game from the Raiden series, the odd part is that you control flying anime style schoolgirls with abnormally large breasts and a penchant for wearing revealing clothing. If this wasn’t disturbing enough Bizarre Jerry 5’s intro cinematic (unlocked shortly into the game) is easily the last thing you want anyone walking in on. While all these mini-games both control and play very well, there are a few stand-outs. Both Pizza With A Vengeance and Man The Meat are extremely addictive and will easily have you putting hours into collecting cash. This hard-earned money can then be used to buy training time at the gym, weapon upgrades and clothing accessories. 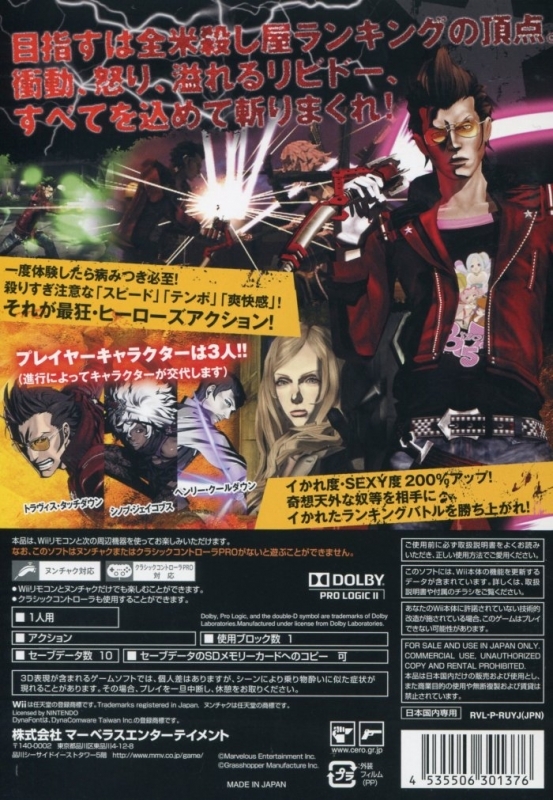 The game also features multiple playable characters one of whom is Shinobu Jacobs, an assassin Travis defeated in the first game, but decided to spare her life. Well she is back, and this time she decides to help Travis along, even referring to him as her ‘master’. For the most part Shinobu plays the same as Travis with one major exception. Instead of having melee attacks, Shinobu has aerial attacks and the ability to jump. 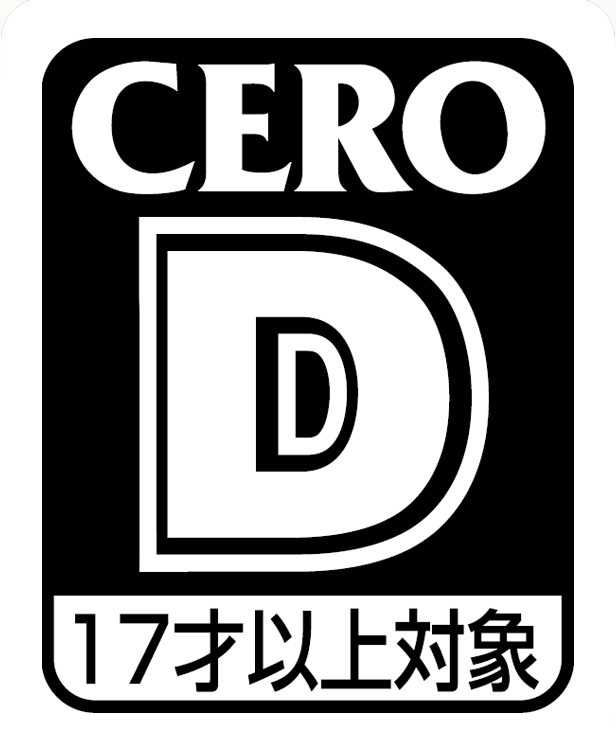 And that is the major disappointment in the gameplay department, as most of her levels feature extensive platforming sections that, coupled with the already sketchy camera result in a frustrating experience as Shinobu will constantly fall off platforms or jump back to the ground floor after you have climbed to the top of a high area. The other playable character is (as of the time of writing) still considered a secret. Sorry. 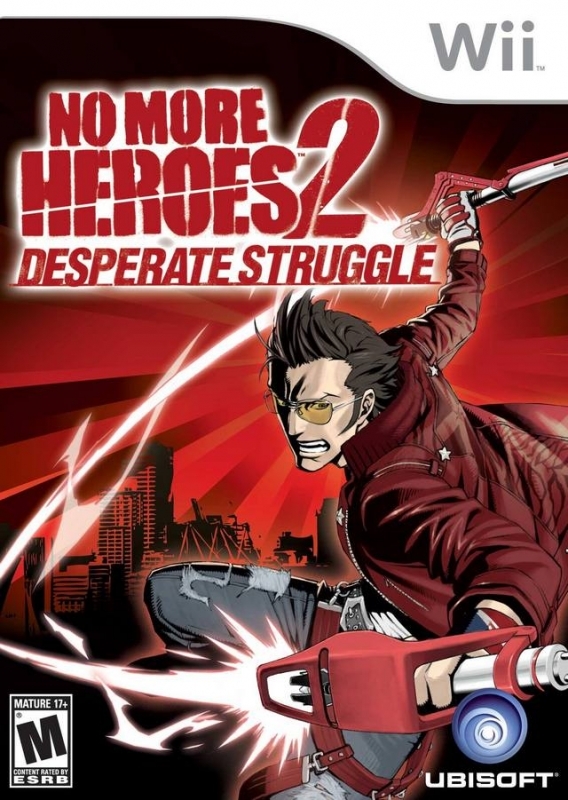 With all these different gameplay styles it’s easy to see that No More Heroes 2: Desperate Struggle has a lot to offer in terms of variety. You will find yourself jumping from assassin missions, to 8-bit menial jobs to helping your cat lose weight, to the gym to build stamina, to back to your hotel room to watch the Bizarre Jerry 5 movie eleven times (or is that just me?) and finally back into another assassin mission, all of which will make sure you never get bored while playing the game. The only frustrations to be found are with a camera system that only works half the time and will leave you staring at the wall the other half and the terrible Shinobu platforming sections. 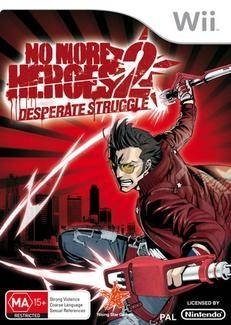 No More Heroes 2: Desperate Struggle is depicted in a unique grindhouse meets anime presentation, meshing elements from both to create a style that is unique to the series. Combine this with the amazing work that was done with the cel-shaded graphics and the amount of details that went into the environments and character designs and you are left with a game that is visually on par with the Wii’s best looking games. 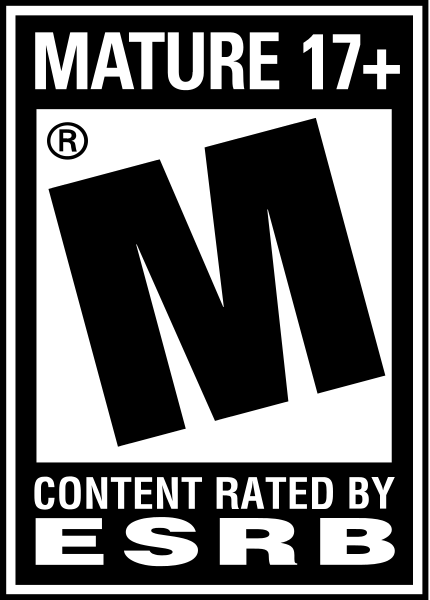 In fact, the only faults that can be attributed to the game's visual presentation lie within the technical aspects, as slowdowns in the framerate are common, especially when the action gets frantic and there is a lot happening on screen at the same time. Another technical nuisance are the short but common loading screens that constantly break up the action and often result in the game being broken up by 3-6 second loading screens for every 2-5 minutes of actual gameplay. Also the 8-bit mini-games are very faithful to that long gone era of gaming that they are emulating, complete with ‘blow in the cartridge’ introductions. The graphics are clean and sharp and switching from the ‘modern’ graphics of the main game to the classic style is never intrusive and flows very naturally. 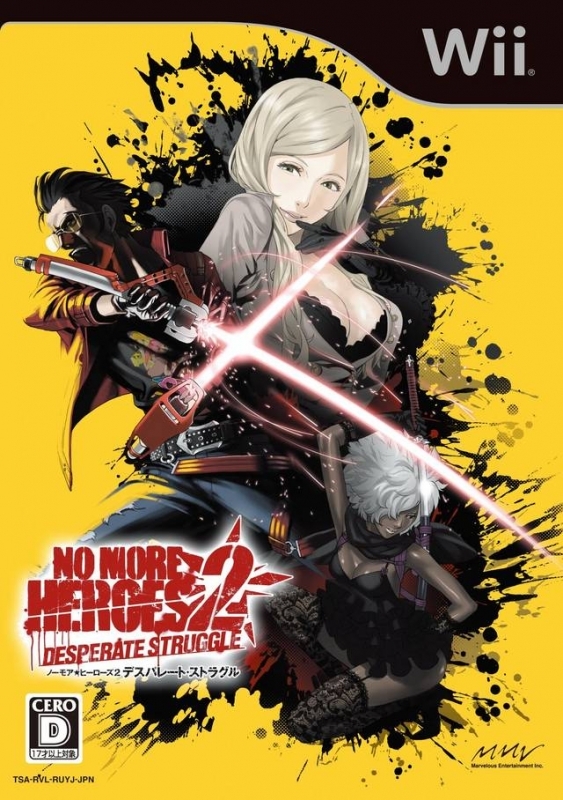 Most of the music in No More Heroes 2: Desperate Struggle consists of variations on the standard No More Heroes theme made to fit the level you are in. For example, a stage set in a creepy forest will have scary sound effects and distortion the track while another stage set in a machine factory will have a heavy metal atmosphere. While this does limit the amount of tracks found in the game, the main theme is catchy and one that you have stuck in your head long after you have turned off the game. The mini-games all have their own 8-bit soundtrack and sound effects, complete with synthesised voices, like those found on the Intellivision back in the mid-80s. These are particularly hilarious, mostly for the foul language used as there's nothing funnier then hearing ‘tastes like sh*t’ through highly digitized audio. Speaking of expletives, Desperate Struggle definitely earns its ‘M’ rating. Most of the characters drop the f-bomb as they are being decapitated and Travis is clearly also a fan of the word. As for the rest of the voice acting, the characters all speak well, with their dialogue and emotions registering clearly with the player. However, it does seem that enemies will spurt the same lines repeatedly until you silence them with a swift katana slice. Finally, it’s obvious the same voice actress was used for most of the female characters in the game, and even uses the same accent for each. This is evident and can lead to some confusion as to who exactly is talking. 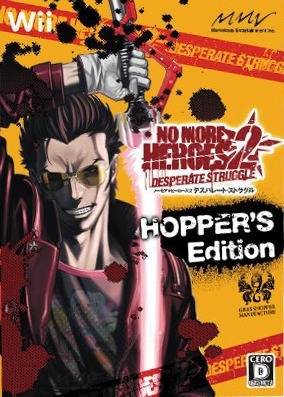 While the main story will take players on average between 7 and 11 hours to complete, No More Heroes 2: Desperate Struggle does offer tons of replay value with loads of unlockables to find, like decorations for Travis’ room and different outfits and clothing accessories. The game even has a deathmatch mode (has to be unlocked) so even after you beat the main game you can still come back for more blood soaked good times. All of this without even mentioning the eleven mini-games that can rapidly get quit addicting and have you sinking even more hours into your save file. However it seems that the developers missed a golden opportunity to include a multiplayer mode, as deathmatches against friends and competitive 8-bit mini-games would have made this game a must own for mature multiplayer gamers on the Wii looking for a hilarious way to spend time with friends. While the original No More Heroes set the bar high for action games on the Wii, Desperate Struggle absolutely surpasses it in every way imaginable. Refined gameplay, stellar presentation values and hours of extra content past the main campaign all come together wonderfully to make this a must own for Wii gamers with a slight taste for carnage. Despite some slight technical miscues, Suda 51 has delivered a game that is loaded with his unique personality and one that Wii owners should not look over.